Computers and binary code aside, the pride and joy of Campagnolo's new Electronic Power Shift, or EPS, is the Record 11 EPS Rear Derailleur. It represents the vanguard of shifting technology, and is the result of twenty years of research and development by Campagnolo. Elegant, advanced, and precise, the Record 11 EPS Rear Derailleur is a benchmark in component innovation, and is already a must-have for anyone seeking the best. Even Campagnolo naysayers will be drooling upon sight of the Record 11 EPS Rear Derailleur, proving that some things are worth the wait. Simply put, the Record 11 EPS Rear Derailleur is smart. It operates on an electronic actuator comprised of a gear motor and a built-in resolver sensor. The actuator controls a worm screw, in the place of a mechanical spring screw, to move the derailleur. In turn, the actuator's resolver sensor is in constant communication with Digital Tech Intelligence, the brains of the system, charting every movement of the derailleur and positioning it optimally, relative to the cassette. The relationship between the electronic actuator and DTI brings an exciting new feature to EPS: Multi-Shift Technology. The new Multi-Shift enables a shift through all eleven cogs, up or down the cassette, in one compression of the shift lever, and in one and a half seconds. You read that right. To help alleviate the necessity for auto-correction, Campy studied the detrimental effects of vibration on electronic components, and applied tin to the electronic actuator to reduce play. Going even further, Campagnolo engineers bolstered the strength and rigidity of the derailleur by creating a parallelogram carbon fiber derailleur cage with an alloy inner plate. 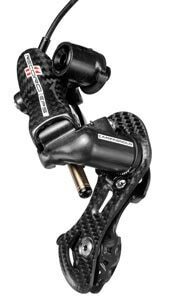 The upper and lower bodies of the derailleur are coated in a techno polymer carbon fiber blend that is both functional and beautifully Campagnolo. The differences between Super Record and Record EPS rear derailleurs are minimal. The Record 11's rear derailleur has a solid parallelogram body without the knocked-out outer plate of Super Record, adding a minute weight gain. Record 11 also has a silver gear motor instead of black, and its pulleys roll on standard bearings instead of Campagnolo CULT ceramic bearings. Campagnolo incorporated a multitude of user preference options into the Record 11 EPS Rear Derailleur. For one, it's now possible to perform Micro Adjustment to the rear derailleur on the fly by engaging Ride Mode from the Switch Mode button on the Record 11 EPS Ergopower Shift Levers. 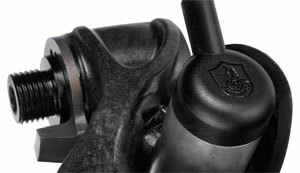 This enables the derailleur to make seven incremental adjustments, at 0.25mm per adjustment. However, after the initial Zero Settings derailleur alignment procedure, the derailleur is practically a sentient being, memorizing reference positions to calculate preferred positions for operating conditions. In preparation for multiple riding experience levels, terrain, and environments, Campagnolo designed the pulley cage to accommodate a diverse range of cassettes, from 11-23 to 12-29. Taking into account that not everyone rides for MoviStar and has a fleet of support cars trailing along behind them, Campagnolo included the Ride Back Home function to act as a fail-safe against a dead battery or crash. The Ride Back Home Function utilizes an uncoupling mechanism that allows the derailleur to be manually uncoupled to the desired position on the cassette, making it possible to ride home in single-gear mode. The Record 11 EPS Rear Derailleur is also IP67 compliant, a rigid international standard for electronics that requires protection of electronic components from water and dust alike. To give you an idea of how stringent this test is, every Campagnolo EPS component had to operate perfectly while submerged under water for 30 minutes. Over the past two decades, refused to compromise as it worked to create the most innovative electronic shifting system in the world. The Record 11 EPS Rear Derailleur was born out of Campagnolo's electronic obsession, and is now the rear derailleur against which all others will be compared for years to come.